Thread: How would you do this? 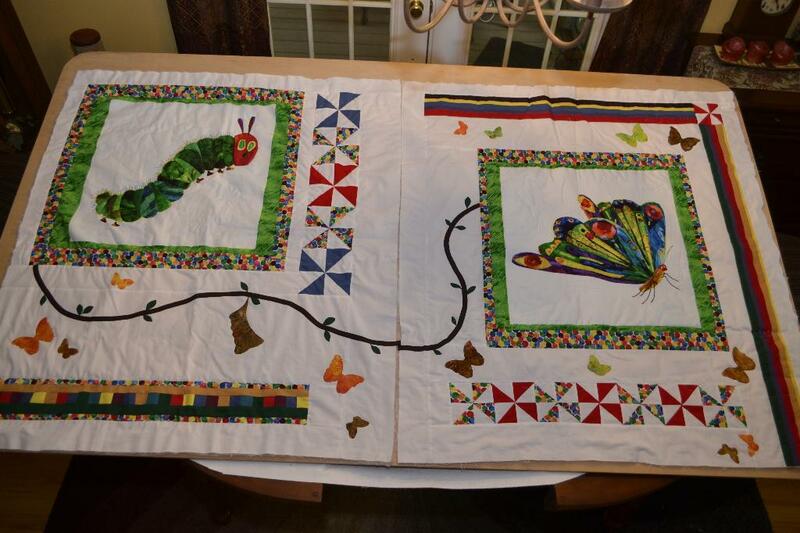 I bought the two largish panels of The Very Hungry Caterpillar (two life phases) and want somehow to focus them in a baby quilt with something suggesting the progression from one phase to the next. I was thinking to put the caterpillar at the bottom left and the butterfly top right and somehow make a wandering dotted line between them. The colors are bright primary ones, and I am also at a loss as to how to design the rest of the quilt front. Maybe white frames around the panels and some wandering geese or half square triangles or... All I have found looking for 'panel quilt' is a single panel. The book this comes from is apparently 40+ years old, but I can photograph the panels if that would help you imagine. Think I need to upload a picture. I made this quilt for my daughter's preschool. I had the panel with the caterpillar but I think it was larger than yours. It had some of the food around the caterpillar. I cut it apart so the food was in strips and sewed them together so that they ran across the quilt. Had co-ordinating fabric also that I used. Don't remember exactly cause it has been a while. Are you lookig for a design of this quilt? 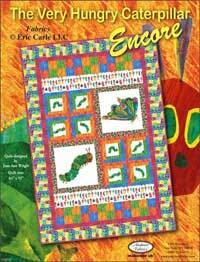 Search on hungry caterpillar quilts in Google and you will see some. Your idea sounds just fine. Have confidence in yourself and go for it. Last edited by sewmary; 06-04-2013 at 12:47 PM. 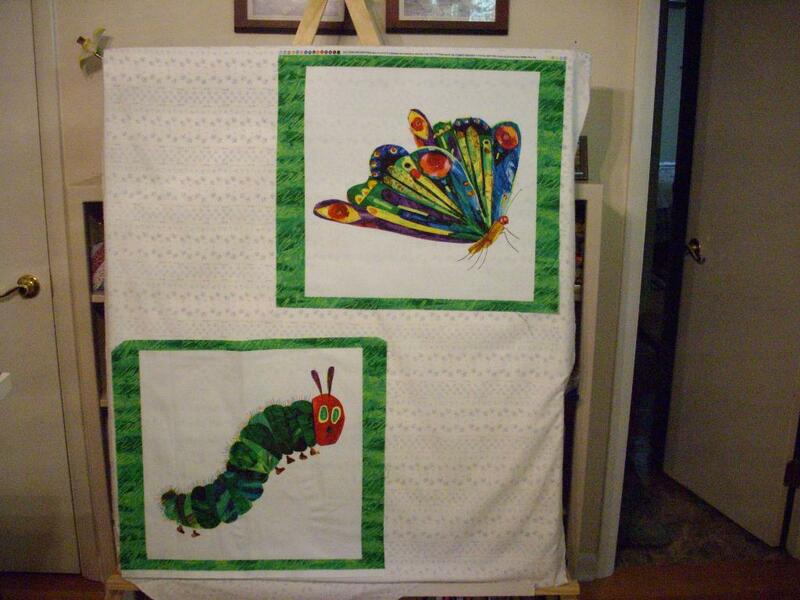 I made a quilt with Hungry Caterpillar fabric for my grandchildren a couple years ago. If you can find it, there are some really cute coordinating fabrics that go with those panels. 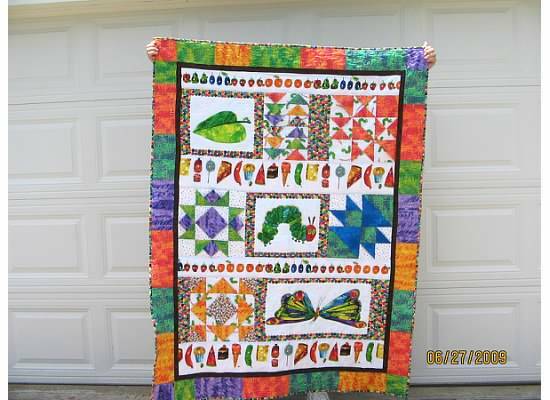 I don't have a pic of the quilt I made, but here is link to one just like it. The pattern was in a magazine. Link didn't work. Will try again. Here is a pic of a quilt like I made. Lee those squares are very cute. Why not do some winding flying geese from one stage to the next, kinda like an arrow. That's an idea I will consider. I wanted a winding 'path' and maybe I will have to do an applique tree branch to do that. Do you think brown bias tape would work? I have never worked with curves on a quilt top. I bought some of the multi-dot that is the first sash. Otherwise will use bright primary solids I think. Thank you for this link! I still think I want to do something different, 'quieter', and will experiment with bias tape to make a twig-like link, maybe even with a cocoon, between worm and butterfly. I do have a yard of the busiest dot fabric to work with, too. Thank you for taking the time to look this up for me. This looks very much like the one I made my niece for her daughter several years ago. Is it the design that the fabric company put out? As a side note: my niece and her husband have another child now, and the Very Hungry Caterpillar quit shows up in almost every photo of the kids playing! I'm tickled they love it! I first saw the busy dot fabric on Amazon, and then the site recommended the 2-panel to coordinate. That is my full experience with this, tho the original book came out when my boys were reading-to age, so maybe I just forgot. All other quilt patterns I have seen for it came thru this blog. I am glad to hear the quilts are such a success. SherriB, your quilt is amazing!!!! When my kids were small, this was a favorite book at storytime. Thanks for reminding me about those special moments. I am sure whatever you come up with will be cherished. My first thought was some rick rack to wandering path to the butterfly. I do like the idea of the curved flying geese, just have never tried to make those. I love what you are doing, the panels are darling, if it were me, I think I would put the catapiller on the top left and the butterfly on the bottom right, it speaks more of a progression. Maybe something flowing between them like your dots maybe shades of color. 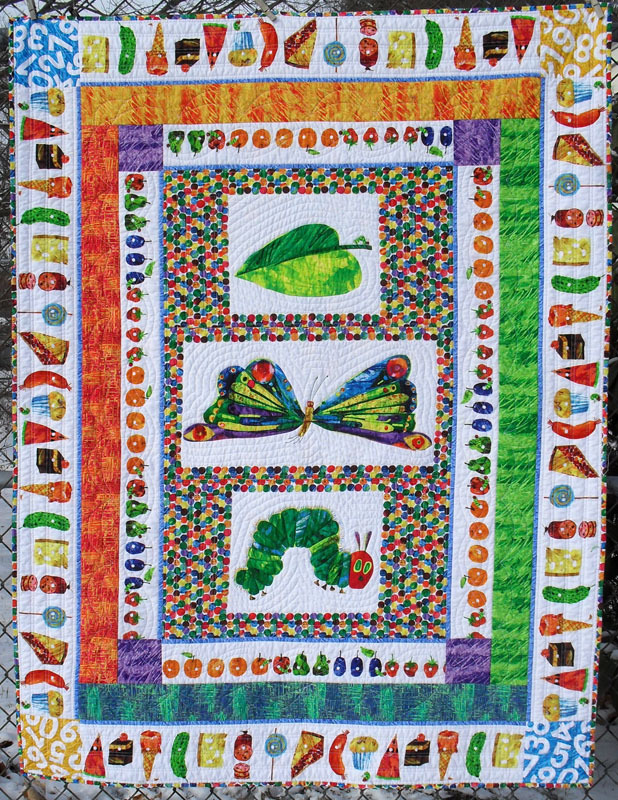 This is the quilt my daughter designed using the Hungry Caterpillar panel. This is the pattern from Andover Fabric too bad all of my grand are too big for this quilt. I can wait few years for greats! When I make a quilt referring to a book, I give the book with it. The Very Hungry Caterpillar is still available. It has been a HUGE favorite with children for years. My youngest grandson memorized it by the time he was 3, because he had us read it to him so often. I did end up buying the book to go with the quilt. My quilt ended up two-sided with asymmetrical sides, so quilting was a bear, and in fact I mostly used ties (hundreds of them it seemed like!). I used bias tape with leaves to travel from the caterpillar, via cocoon, to the butterfly. I was so excited when the glue dots on the ties finally dried that I mailed it off without a picture! Here is the last one I got before sandwiching the two sides. Okay maybe I am wrong, but shouldn't the caterpillar be first? He did come before the butterfly right? They are very cute though. Great for a baby or child's quilt! The caterpillar is on one side and the vine thing connects him, via the cocoon, to the butterfly on the other side. Lee, I love it! You said you wanted the quilt to be "quiet" and you did it so wonderfully!! It has just enough color and movement to capture a child's attention without being overwhelming. Your vine is a great way to connect the two sides. Great job!! I would add some things the caterpillar feeds off of and then what the butterfly feeds off of and then add a line of connection.